1953 - Massachusetts College of Art, B.F.A. Numerous cash prizes in national, regional, and state exhibits. National second place award for "first day covers"
Work in collections of Rutgers University, Farleigh Dickinson University, Montclair State College, Upsala College, Bloomfield College, East Brunswick Library, South River Library and Municipal Building, and the International Museum of Cartoon Art. Also, several hundred private collections. 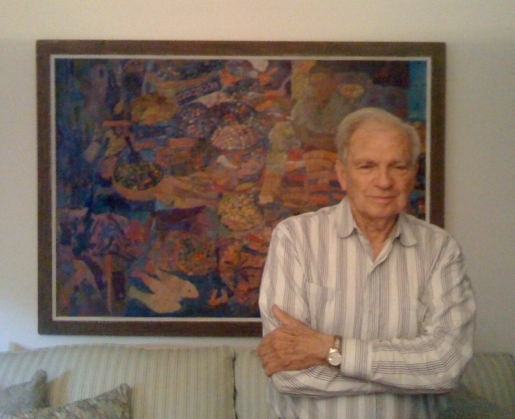 Don Bloom began his professional painting career in 1954. His lengthy biography has appeared in Who's Who in American Art since 1970. He has been awarded numerous national prizes in painting and editorial cartooning. His work has been selected for the Whitney Annual of American Painting, and he was a 1960 recipient of the Guggenheim Fellowship for Creative Painting. Bloom is best known as a painter, but he has also pursued a rich career in cartooning and illustration. He illustrated Piscataway Story (1982) a two-volume workbook for children, authored by Margery Oleskie. He also worked for many years as an art educator. He served as an art teacher for 34 years in the Piscataway (New Jersey) Public School System, and for 17 of those years as the Chairman of the Art Department. Don Bloom's work appears in many prominent public and private collections, including the estates of Rod Steiger and Billy Rose. His first-day covers were displayed at the Baseball Hall of Fame in Cooperstown, New York. From November 2000 to March 2001, he was recognized through mayoral proclamations in East Brunswick, North Brunswick, and South River townships. Don Bloom was born in 1932 in Roxbury, Massachusetts, son of Evelyn and Maurice Bloom, who later moved to West Newton, MA. Bloom has been painting since 1954, and earned a Master of Fine Arts degree from the Instituto Allende in San Miguel, Mexico. He received the 1960 Guggenheim Fellowship for Creative Painting and the Huntington Hartford Fellowship, the same year that his work appeared in the Whitney Annual. Bloom has been listed in Who's Who in American Art since 1972. He was also named in Who's Who in the East and Who's Who among American Educators. He works in oils, watercolor, collage, ink, and a variety of mixed media. Bloom taught in the Piscataway, New Jersey Schools from 1958 until 1992, when he retired. He was an Art Supervisor, Grades K-12, and was also an Instructor at Trenton State College. He served as an Editorial Cartoonist for Greater Media Newspapers from 1978-90. In the Suburban Newspapers of America's annual journalism competition, he was selected twice for the national award, second place in 1985 and third place in 1988 in the category of Best Editorial Page Cartoon. Bloom was been a professional Caricaturist and Illustrator from 1980 to 2016. He was commissioned to do artwork for many cachets or "first day covers"--miniature artwork that is on the envelope associated with a new stamp. Bloom passed away on June 12, 2016 at the age of 83. 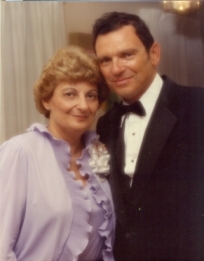 A devoted father and stepfather, Bloom had a daughter, Deborah Berman, and a stepdaughter (Lisa Hughes nee Julius) and stepson (Richard Julius) from his late wife Jeanette's first marriage. 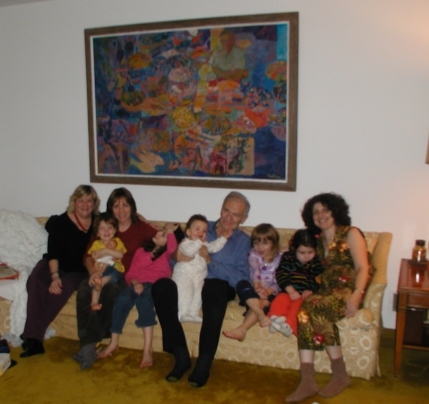 He had 5 granddaughters, all girls: Melanie Berman, Hannah Berman, Julia Berman, Meghan Hughes, and Sarah Julius. Web site copyright © 2011-17 Richard Julius. Artwork depicted herein is copyright © 1950-2016. All Rights Reserved. No photos or images may be used without the express permission of the family of the artist.